We mentioned in our Fence Building Checklist that you are going to have to work with your Homeowner’s Association on your fence project. If you don’t follow their guidelines, you may face fines and even be forced to remove your fence! It’s important to do your research before you begin your project or make any final decisions. Your HOA may have a surprising number of fence-related rules. They can dictate the style, height, and type of fence. They may also have standards for fence upkeep and maintenance. 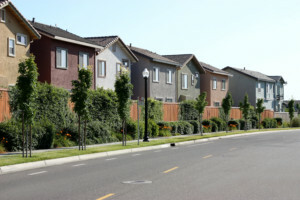 You can find your HOA rules, including those about fences, in a legal document called the Declaration of Covenants, Conditions, and Restrictions (CC&R). Be sure to check for any additional documents which clarify and elaborate on these rules, . You might consider meeting with someone at your HOA in addition to doing the reading. It never hurts to associate a friendly face with your request and make sure you have all of your bases covered. When you know the dos and don’ts of fences in your community, you are ready to start preparing your proposal. This is the ideal time to call us for quote, because it’s time to gather as much information as you can about your future fence. You will need to include details about the material you intend to use, pictures of the style and type of fence, and blueprints and diagrams showing the proposed location of your fence. Before you submit the paperwork to your HOA, double check everything and make sure there is nothing you missed. After making any necessary edits, make a copy for your own records. Send in your request by certified mail and follow up to make sure it has been received. If possible, get a confirmation of receipt in writing. It may take up to six weeks to receive a final decision. With luck and some careful planning, you will get the green light to go ahead with your fence as planned. If your fence installation proposal is initially rejected, you can request a meeting to ask specific questions or file an appeal. Be prepared for a long haul, though. Homeowner’s Associations often meet infrequently and sometimes respond slowly to requests. Putting your best foot forward with your fence proposal can help you avoid a prolonged back and forth and get the fence you want, when you want it. If you live in our Milwaukee metro service area and are trying to find a fence that fits your needs AND your HOA requirements, give A-1 Fence a call. Get your free quote on our cedar, aluminum, vinyl and horse fencing today!